Billy Bragg returns to Cambridge to play three unique shows on consecutive nights as part of his "One Step Forward. Two Steps Back." 2019 tour. 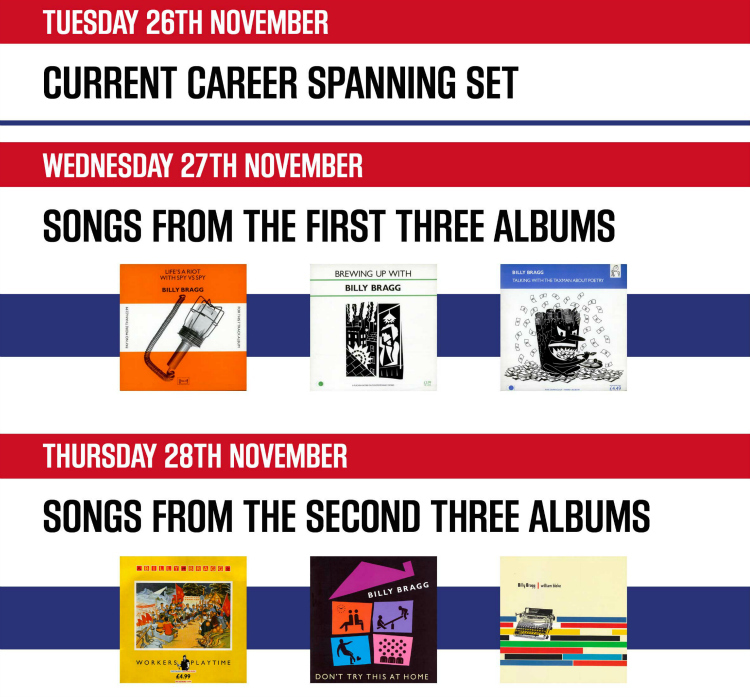 TUE 26 NOV - Bragg’s current set, which ranges across his 35 year career. WED 27 NOV - Songs from his first three albums: Life’s a Riot with Spy Vs Spy (1983), Brewing Up with Billy Bragg (1984) and Talking with the Taxman about Poetry (1986). THU 28 NOV - Songs from his second three albums: Workers Playtime (1988), Don't Try This at Home (1991) and William Bloke (1996). Box office, bar and doors open from 7pm. Grace Petrie delivers an alternative, folk, and comedic take on life, love and politics.